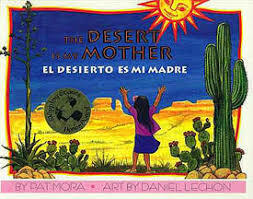 Our Cover to Cover Book of the Month for March is The Desert Is My Mother by Pat Mora. The desert is mother to all of us Tucsonans and how lucky we are to live in such a beautiful place! See the beauty of the desert as your explore the vibrantly illustrated pages of this book! The desert is a beautiful place that provides for us in many ways! The Desert Is My Mother by Pat Mora depicts how the desert provides for a little girl, and the gratitude she feels for its generosity. While reading, talk with your child about the meaning of gratitude. Talk about the things that make you feel grateful. Invite your child to think about the things she is grateful for. Vocabulary is an important early literacy skill and books provide the perfect opportunity to introduce new words! Chant, bloom, heal, and prickly pear are just a few of the many words found in this book that may not be used every day. While reading, invite your child to think about the meaning of any unfamiliar words you come across. Are there any clues in the story that can tell you what they might mean? Send a picture of you and your child painting with ice cubes! Be creative! We can’t wait to see what you loved about The Desert Is My Mother!